The third, and possibly most eagerly-awaited X-Men movie yet, The Last Stand ushers in the 2006 summer season as one of the first genuine blockbusters of the year. Directed by Brett Ratner, it sees the returning cast of the previous instalments (Hugh Jackman, Patrick Stewart, Ian McKellen, Halle Berry, Famke Janssen, Rebecca Romijn, Anna Paquin) joining up with some new faces (Kelsey Grammer, Vinnie Jones, Olivia Williams, Shohreh Aghdashloo) in a complicated plot involving a cure for mutantism, a resurrected mutant whose powers are out of control, and a powerful war between the good and evil mutants for the fate of humanity. It’s all lofty, exciting-sounding stuff, and deserving of a score to match its epic aspirations. 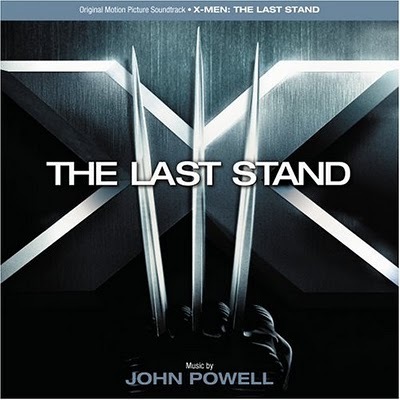 X-Men: The Last Stand is, by far, the most ambitious score John Powell has yet attempted to write, at least in terms of size. A multi-themed, large scale work for a full symphony orchestra, choir, electronics, and an increased percussion section, the score is nothing if not ambitious – but, in a way, that is part of the problem as to why it fails to deliver the goods – but more on that later. There are three core themes: a powerful, driving march, all slashing strings and brass fanfares, with a percussion ostinato reminiscent of John Williams’ work on Superman, which first appears in the thunderous, majestic “Bathroom Title”, and triumphantly re-occurs in “St. Lupus Day”, “Attack on Alcatraz” and during the latter part of the conclusive “The Last Stand”. A noble secondary theme for Jean Grey’s resurrected super-hero Phoenix, performed on surging strings with a lilt redolent of Goldsmith and Silvestri’s work on the Mummy franchise, first appears during the second half of “Dark Phoenix’s Tragedy”, and is carried through to make important appearances during the climactic pair “The Battle of the Cure” and “Phoenix Rises”. Finally, a bittersweet, beautifully searching string theme – a sort of cross between John Barry’s Out of Africa and Jerry Goldsmith’s Medicine Man – reveals itself during the gorgeous “The Funeral”, providing the score’s thematic high point. Quite a lot of the first half of the album consists of low-key suspense music, gradually building up to the second half’s inevitable confrontation, but some of it is nevertheless quite impressive: the angelic choral work and sense of awe and wonderment in cues such as “Whirlpool of Love” and “Jean and Logan” is excellent; the skittery pizzicato string writing in the first half of “Angel’s Cure” is perfectly unnerving; the soothing, gently romantic respite in ‘Skating on the Pond” marks the final calm before the storm. However, as I hinted at earlier, I think that the main problem with X-Men: The Last Stand is that, by and large, Powell tries too hard. Every action cue is a dense, multi-layered epic of its own, with an immensely complicated musical structure, different rhythmic elements, and sections of the orchestra all playing their own little individual opuses. Taken apart, each element is deep and intelligent; however, when you listen to them all at the same time, it’s so thick it’s like trying to listen to mud. You have violins competing with violas competing with cellos and trumpets and horns and trombones, all playing different things simultaneously so that you can’t hear any of them. Add to this a cache of twittering woodwinds and the various percussion elements – bass drums and pounding timpanis and rolling gongs and hammering anvils and clashing cymbals – and THEN add a shrieking Latin choir, and eventually it all becomes too much. As such, the “Dark Phoenix Rises” cue and the entire 25-minute finale – from “Cure Ward” through to “Phoenix Rises” – is a loud, predominantly incoherent mess. It’s perfectly clear that Powell tried to write something epic and emotional, powerful and dramatic, and stretch his musical muscles, but I personally found it to be far too overblown. What happened to simple, clear action writing, where you can hear every part of the orchestra in complementary unison, but you can still feel the excitement and the energy? It’s just not there in this score. At times, parts of it sound like something Elliot Goldenthal or Don Davis might write on their most impressionistic and dissonant days; at others, Powell seems to have taken his cue from John Williams and Jerry Goldsmith. For the most part, though, he doesn’t seem to be able to make up his mind what he wants to do, so he does everything all at once, just to keep all the bases covered. From this you may get the impression that the action writing is all bad: it’s not, and there are several moments of clarity where Powell’s talent for this kind of writing shines through: the opening part of “Attack on Alcatraz”, and the rapid-fire but brief “Massacre” are of special note. In these moments, you see just what a splendid action score this could have been, before you plunge again into the murky depths of Powell’s coagulated compositions. John Powell is a hugely talented composer, and some of his earlier works – Agent Cody Banks, Evolution, Paycheck, Robots, Shrek, Antz, Chicken Run – are quite superb in their own way. With X-Men, though, I found that his need to succeed came dangerously close to it sounding like him showing off: he didn’t need to do everything he did, to make the score so unflinchingly complicated and busy. It suffers as a result. I could almost imagine a young 22-year old writing something like this when given free reign with an orchestra for the first time, as a desperate need to impress a future employer. In the grand scheme of the X-Men universe, I like this score more than John Ottman’s rather dull effort in 2003, but Michael Kamen’s work on the 2000 original remains, for me, the unequalled musical pinnacle of the franchise. Music composed John Powell. Conducted by Pete Anthony. Orchestrations by Brad Dechter, Rick Giovinazzo and Kevin Kliesch. Recorded and mixed by Shawn Murphy. Edited by Tom Carlson and Peter Myles. Album produced by John Powell.